Hilarious, gorgeously illustrated and with a classic feel, this is the next step up for readers of Kes Gray and Jim Field’s bestselling OI FROG! Bear wakes up early from hibernation. If she can’t sleep, then at least she can make a snowman. Rabbit has never made a snowman, but he definitely wants to make one that’s better than Bear’s. But with an avalanche and a hungry wolf heading his way, Rabbit soon realises that it might be nice to have a friend on your side. 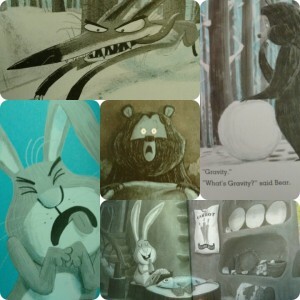 Rabbit’s Bad Habits grabs your attention from the first double page spread, with a stark white page on the LHS, and Bear’s shocked expression on the right (see picture). And what an opening line: “As the robber left the cave, he stood on Bear’s nose.” How can you not want to read more? 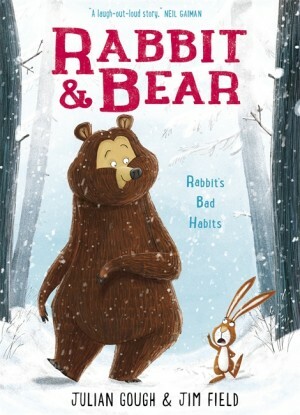 Rabbit’s Bad Habits is surreptitiously educational (gravity, why we need food, hibernation…) but mostly very funny, with a feel-good ending leaving you wanting more tales of the new friends, Rabbit and Bear. It would have been all too easy to have unthinkingly made all three characters in this book male, as many animal tales tend to, but Bear is female which is nice to see. A page turner of the best sort, Rabbit’s Bad Habits is one to re-read over and over. The text doesn’t get old on repeated reads. and you can spend ages on each page with the illustrations. It makes a great read-aloud (and is possible to read in one session), as well as an inspiring early reader. Much giggles ensued in Chaos Castle reading Rabbit’s Bad Habits, and it’s not made it onto a bookshelf yet because it’s needed in reach of small hands (and big!) An excellent addition to the Castle library, and we’re looking forward to the rest of the series.